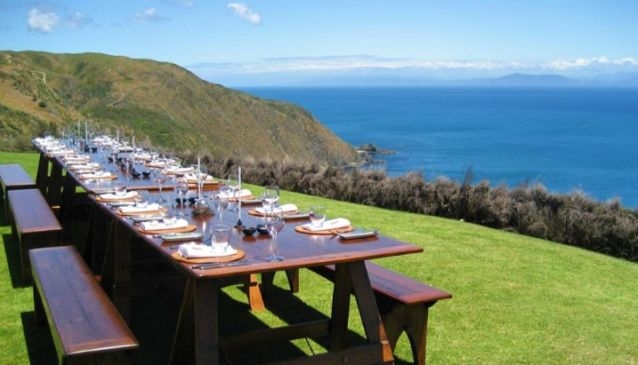 The Lodge at Boomrock is high on a cliff above the Tasman Sea, in 3000 acres of picturesque farmland. The venue mixes its stunning location with fine food and New Zealand wines to create the perfect place for weddings, parties, and functions. Inside, the Lodge features Jarrah wood floors, beamed ceilings and an open fire to keep guests cosy while outside a manicured lawn provides a picture perfect wedding venue. Staff can organise extra events for wedding guests or conference delegates including archery, clay pigeon shooting and golf and the Lodge's chef can prepare a seasonal menu to suit any taste.